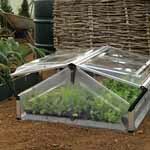 For protecting tender plants and extending the growing season of vegetables, this high quality coldframe, providing an impressive 1.13 sq.metres (12 sq.ft) of growing space, will prove itself invaluable. Features include:Virtually unbreakable, UV resistant, polycarbonate lid, acrylic sides, and rust-proof components - needs no maintenance ever!Two easily adjustable, fully removable lid panels for variable ventilation and easy access from both sides, which are also held securely when closed.Weather-tight, sloping, clear-as-glass polycarbonate lids for minimum heat loss and maximum sunlight penetration.Size 108cm (421/2) x 105cm (411/2) x 53cm (21) maximum height. Ground fixings not included. Flat packed for home assembly.